He’s been in a strict platoon with Josh Satin since his return to the majors, and that may be one of the keys to his recent success. On the season, he’s still hitting only .153 against southpaws. And since the Mets have faced a disproportionately high amount of right-handed starting pitchers recently, he’s had a lot of playing time, which usually helps guys with long swings. For the second straight year, Davis had no approach at the plate and looked lost for the first half of the season. Each time, something clicked – this year at Triple-A Las Vegas – and Davis started producing again. But how much of this is a tease? By the time Ike finished 2012 with 32 home runs, we thought he was back. We thought he was the Ike Davis we saw in his rookie season. We thought he was back to being the complete hitter we saw in 2011 before the collision with David Wright that knocked Ike out for the season. Now, we’re seeing a patient hitter who doesn’t chase junk outside the strikezone. If he doesn’t get a pitch to hit, he takes a walk. Pitchers will eventually start giving him pitches to hit when they fall behind, and he’ll eventually start driving them over the wall. It’s almost like Davis is learning to hit again from the ground up. And what if Davis gets really hot in September, when he’s facing weaker competition and teams that are playing out the string? The only contending teams the Mets will face that month will be the Cleveland Indians and Cincinnati Reds. They’ll play the Washington Nationals and Atlanta Braves early in the month, but the Braves, already 14.5 games ahead of the Nats, may have run away and hidden by then. And even if Davis is firing on all cylinders within a couple of weeks, how do we know he won’t revert to where he was at the beginning of last year or the year before. Being a slow starter is one thing, being a black hole in a lineup for the first three months of a season is another. Is two years enough to spot a trend? The Mets have a tough decision to make with Davis. He has no apparent trade value, so if the Mets choose to cut bait, they’d have to non-tender him. He could be successful with another team, but no one knows. The Mets also have other options at first base, though none of them are lead-pipe cinches. Lucas Duda needs a place to play, and with the team’s improved outfield defense since his injury, the most logical spot for him is first base. Duda hasn’t been consistent enough to be the 30-HR player he looked like he could be back in 2011, but he does get on base, and (if he stays healthy) could be a 20-25 home run guy. Wilmer Flores has 8 RBIs in his first 5 games with the Mets despite the fact that he’s hitting .211/.250/.263. If he shows he’s the hitter he was in Vegas this year, Flores will quickly become a contender for the position. When David Wright comes back, Flores will have to vacate third base. First is probably the best place for the big youngster, although if he really impresses, he could replace Daniel Murphy at second, where he played the majority of his games at Triple-A. Not to leave out Satin, but he hasn’t shown much power despite his .296/.420/.429 slash. He’d probably be best suited for a utility role. All the Mets can do now is see how the rest of the season plays out. If Davis continues to improve, and Duda and Flores don’t distinguish themselves, the Mets may have to take another chance on Davis in 2014. 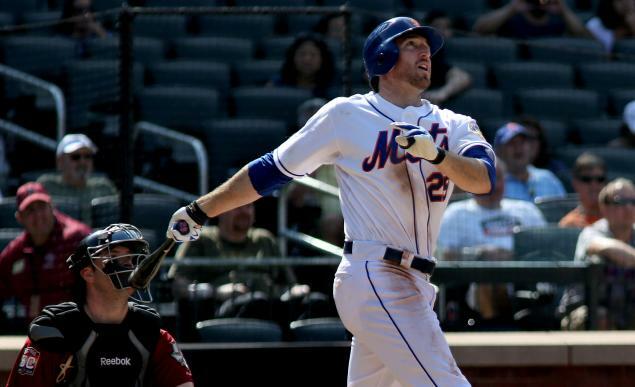 Whether they keep him in their plans or not, whatever the Mets do with Ike Davis will contain some risk. True, the Mets may have to pay to find out about Davis, but, as Joe wrote in his write-up of yesterday’s game, he has defensive lapses on the field and really not much range. I would give it another year, but with Duda and Flores needing to play, the Mets need to figure out and keep their best players and let Satin and his type go. Nice guy, but, no pop, no glove, where does he fit? Ken, my point is that when the team becomes a contender, Satin’s lack of power and lack of defensive prowess means that they are having a middle infield type hitter at first base. However, middle infielders are usually pretty good glove men. So, Satin’s good average may be ok for a bench spot, but he isn’t your solution at first base. Consequently, if Flores goes to 28 years old and doesn’t develop any power and does not have good defensive instincts, he will be in the same position. The only variable that will keep these guys in starting positions, under that circumstance, is clutch hitting, and that takes a little luck too, because line drives get caught. Let the market decide. Send away whoever brings back the best return! In theory, I could see the Mets giving Ike another chance next year in a platoon with Satin. But I’d just as soon see Flores there, unless of course they give him second base. I have zero interest in seeing Duda play for the Mets. The last time he had my attention was the end of 2011; since then he’s been uninspiring. Yes, he can get on base; that would have more value if combined with decent power, but I don’t see that happening enough to make a difference. In situations calling for aggressive at bats, I saw a lot of pop flies and walks, resulting in an absurdly low RBI total this year. Duda’s “natural” position may be first base, but he has no speed, and – a word I probably use too often – no spark. I want to see the kind of energy Lagares and Young have brought to the lineup at first and second. What’s the saying fool me once shame on you. Fool me twice shame on me. How many times is Ike Davis going to fool people. Also Why is there so much hate for Duda? He is an Ogre but, he gets on base and can hit the ball a mile, he has good at bats and handles RHP well. He is also at least moderately consistent. I would be absolutely thrilled to see a Duda and Satin platoon at 1b. That way money could go to a power bat in RF and maybe a ss. Also people should stop looking at stereo types Corners provide power that’s stupid. The mets play at CITI FIELD not a hr hitters park by any means so what is this obsession with power. A walk is as good as a single, its a lot better than being aggressive in an RBI spot and striking out. No Duda and Satin are not ideal 1b but, considering the FO’s financial problems they are suitable and much better than the “away player” Ike Davis. Quinn, I understand your point about Duda. However, he has never hit higher than .250, and he isn’t very good defensively. If the Mets go that direction and trade Davis, fine. However, I don’t think Duda is better than a #6 hitter, at best. Looks to walk with runners in scoring position, and reminds me of Rob Deer. I agree with Dan B’s thinking below that you make a decision you can live with. I would have agreed with Quinn two years ago. He is, at best, a moderate power threat – with the bases empty. I think the idea the you can’t let Davis go for fear he will star for another team is a loser’s mentality. Winners find a replacement and moveon without looking back. I think that’s a great point. Can’t worry about the past. And there are certainly candidates to replace him. Yup, especially the kid now playing 3B. Just look back a few years and remember how much everyone loved Ike with as small a sample size as Flores has now. to make a determination on a week or so really is as big a mistake as a baseball evaluator can make. remember Jacobs’ start. Metsie fans were screaming and crying about trading him for Delgado. How is Jacobs doing? Maybe Davis should go, it will be best for him to get away from the Alderson rule of hitting only the tiniest of zones. . But to crown a guy in a week? When are you turning on him? Izzy, you have a good point. However, I’m not sure that many see Flores as the can’t miss guy as much as it is the frustration with Ike. His inconsistent production, along with a perceived deterioration in the field, has led many of us to look to other players. You are certainly right about the Ike frustration. A guy can’t have 3 month slumps every year. And do you think he has returned to form? A bunch of bloops and walks. Too bad he can’t play SS because he’s becoming a middle infielder bat now. As for Flores, we all hope he’s a star but you have to admit the infatuation after a few games is over the top, kind of like it was for Jacobs after that awesome week. Judging by today’s game and his recent performance he’s evolving from free swinging slugger into the second coming of Mike Hargrove in his approach at the plate. Of those five you mention I agree on all but Lagares. His glove, arm and athleticism in CF makes him a keeper. They need to shore themselves up at SS and 2B far more than in CF. I would like to see the Mets finally give up on Davis and Duda, let Satin and Flores battle for the position next Spring. If Satin or Flores can achieve close to a .300 average and drive in 80 or more RBI’s with singles and doubles so be it. I can live with less than stellar defense if one of them can do that. It is a shame that Davis and Duda (and Tejada too) have pretty much destroyed their trade value this season. Totally agree on quick judgment on Flores or any player. Ike became a quick darling and it was very misguided. This is especially true of he defense which was never good except for a couple over the rail catches early. The bottom line with Ike is that when he was drafted there were concerns about his swing and his ability to hit lefties in the bigs and so far those concerns have been accurate. Now with Flores the consensus is that he is clearly not athletic enough to defend anywhere but in a corner. But he has always hit well with excellent BB to K rates. Only his lack of speed is a question on BA and OBP. Power is the real unknown but there is a legit shot that it will develop. At 22 and cheap for 3 years he may well be a better bet than Ike and he will certainly return more in a trade than Ike. That really is the ultimate gauge of a player’s value. Not what some giddy fans think. Dave Your comments seemed fine until you brought up cheap. Cheap means to me you care more concerned about the Wilpon finances than Met wins. Can’t buy the cheap line after giving Wright 138 mil or whatever. The line now is hollow. Are you going to want to dump Harvey when he wants his arbitration $$s to exceed Lincecum’s? Can certainly understand anyone wanting to see Davis go for many reason, none of which is he’s not cheap enough. Murphy is batting 270 with a EGRESSing defensive skills. Therefore not top 3 in baseball.